Robert L. Hinshaw3,6,7,8 [Bert Hinshaw6,8]. Born Jan 1 18662,4,5,8,9,10,11 [Jan 1 18603,7], Greensboro, Henry County, Indiana2,4,5,8,9,10,11. Hinshaw, Robert L., head-of-household, age 34, born Jan 1866 in Indiana; parents born in North Carolina; married 9 years; occupation: farmer; rented farm. Hinshaw, Nellie J., wife, age 29, born Mar 1871 in Indiana; parents born in North Carolina; married 9 years; 2 children, 1 living. 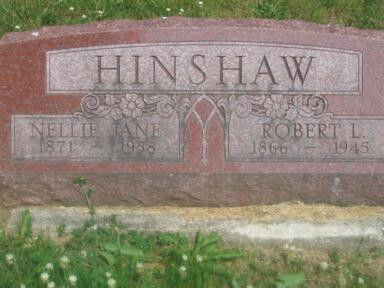 Hinshaw, Fassett R., daughter, age 2, born Jul 1897 in Indiana; parents born in Indiana. Hinshaw, Robert L., head-of-household, age 44, born in Indiana; parents born in North Carolina; first marriage, married 19 years; occupation: farmer, general farm; owned farm (mortgaged). Hinshaw, Nellie J., wife, age 39, born in Indiana; parents born in North Carolina; first marriage, married 19 years; 3 children, 2 living. Hinshaw, Fassett W., son, age 12, born in Indiana; parents born in Indiana; attended school. Hinshaw, Howard G., son, age 6, born in Indiana; parents born in Indiana; attended school. Collins, E[..unclear..], servant, age 61, born in Indiana; parents born in Tennessee; widower; occupation: farm laborer, working out. Hinshaw, Robert L., head-of-household, age 52 [unclear], born in Indiana; parents born in Virginia [sic]; owned home; occupation: farmer. Hinshaw, Nellie J., wife, age 48 [unclear], born in Indiana; parents born in North Carolina. Hinshaw, Fassett, son, age 22, born in Indiana; parents born in Indiana. Hinshaw, Howard R. [middle initial unclear], son, age 16, born in Indiana; parents born in Indiana. Dellon, Josiah, father-in-law, age 83, born in Indiana; father born in North Carolina; widower. Hinshaw, Robert L., head-of-household, age 64, born in Indiana; parents born in North Carolina; first married at age 24; owned home ($6000 value); radio in home; occupation: farmer, general farm; not a war veteran. Hinshaw, Nelle J., wife, age 59, born in Indiana; parents born in North Carolina; first married at age 19. 1910 census, Greensboro Township, Henry County, Indiana; roll T624-355, ED 80, page 102B, line #81, dwelling #117, family #117. 1900 census, Greensboro Township, Henry County, Indiana; ED 61, page 9A, line #33, dwelling #197, family #207. Contribution from Jill Kassebaum () citing: Hinshaw family bible. 1880 census, Greensboro, Henry County, Indiana; roll T9-284, ED 7, page 118A, line #15, dwelling #143, family #145. 1930 census, Greensboro Township, Henry County, Indiana; roll T626-592, ED 12, page 5B, line #74, family #140. 1850-1920, Indiana Works Progress Administration; Book CC-8, page 367. 1882-1920, Indiana Works Progress Administration (child's birth record). 1920 census, Greensboro Township, Henry County, Indiana; ED 62, page 17B, line #17, dwelling #342, family #346. 1910 census, Greensboro Township, Henry County, Indiana; roll T624-355, ED 80, page 102B, line #51, dwelling #109, family #109.